Schloss Elmau is the perfect wintersports resort for anyone who wants to enjoy more than just great skiing, but also great concerts, spa facilities and restaurants in one of the best hotels of the world. 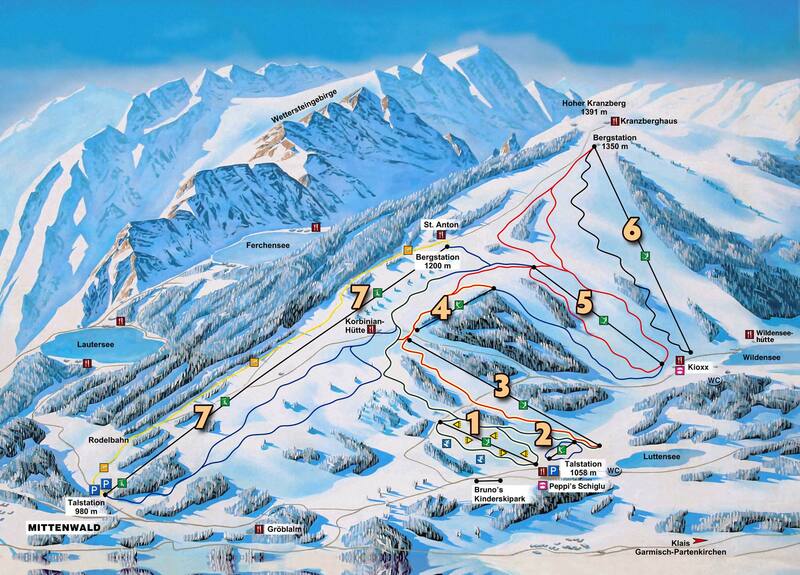 Guests can use the ski service & rental services, private instructors and a free shuttle to the best slopes between Zugspitze, Garmisch-Partenkirchen & Seefeld. Enjoy the deafening sound of silence amid snow-covered valleys. "Mindful Skiing" lets you experience the pristine nature of the Bavarian Alps. Around Schloss Elmau there are more than 300 km of cross-country trails, suitable for all levels. Cross-country skiing has a variety of health benefits. According to Mayo Clinic research, it increases mental ability, lifts the mood, and improves sleep. The "Mindful Skiing" experience is complemented by two yoga classes (Basic in the morning and Open in the afternoon); additional meditation classes and treatments may also be booked. two yoga classes from monday to thursday. Great, sunny slopes for all levels. Fun Park for snowboarders. Shuttle 20 Min. Classic & WM Ski slopes for all levels. Funpark for snowboarders. Shuttle 20 Min. Skiing on the glacier from November to April at 3000m above sealevel. Shuttle 35 Min. Slopes for beginners, families & kids, Shuttle 10 Min. The Schloss Elmau Ski Aacademy is part of the professional ski academy of Alpenwelt Karwendel lead by the former giant slalom world cup champion Max Rieger. You can book your private ski instructor or participate in the daily classes for kids as well as adults at all levels. Guests big and small learn to ski with ease. Varied teaching techniques and individual learning styles are the foundation of our group programs, where we teach in performance groups of different skill levels. Our week-long course ends with a final race and awards ceremony. The latest equipment is available for rent at the hotel. Over 20 miles of the best groomed and picturesque Cross Country routes in the Alpine Region, accesible directly from the front door of Schloss Elmau. Not everybody knows how to cross country ski, but everybody can learn it in Schloss Elmau. 300 km of the best groomed routes 5 min drive from the hotel starting in the village of Klais to Vorderriss and Leutasch.